Welcome to the OWH World Card Making Bloghop! For the wintry theme, I decided to make this Christmas card using OWH Sketch 79 and Stampin' Up! 's Polar Party stamp set. Operation Write Home has been such an inspiration for my Stampin' Up! group. We have been making cards for the troops and have already sent out close to 100 cards. Each month, we collect cards at our demonstrator meeting. I have enjoyed reading the emails from the troops. If you don't already participate in OWH, please visit their blog and join in the fun. Check out these other scrappy strip cards and see OWH sketch 79. Thank you for visiting my blog. Enjoy the rest of the OWH World Card Making Bloghop. Cute card and so cheerful! I love the polar bear! So cute. Very cute! Love the button too! Polar Party is a fun set (I used it for my OWH card, too!). Great minds think alike! :) Happy WCMD! Sweet card...love the colors and love what you did with the ribbon. Great card!!! You used one of my all-time favorite sets! Terrific layering too! Cute card! What a great way to use up scraps and I LOVE your ribbon buckle. Happy WCMD! I love the 3 vertical strips in the background, the dark red is just the perfect color to accent the sentiment, the ribbon and buckle thingy is so pretty and the image is just adorable!! Wonderful card! New follower on FB and subscriber to your newsletter ~ can't wait to see what's next! Hi Sharon. Great card as usual. I love the strips of DSP. It's great how just a little paper can add so much to a card. Love! It's so bright and cheery! (Is that Gumball Green?) The sketch you chose is great and the polar bear is too, too darling! Adorable card! I really like the ribbon/button treatment too. Thanks for hopping with us today! What an adorable card! I love this set-- super cute :) Great job with the ribbon! Thank you for your support of OWH! This is adorable! I love that polar bear!! Love the bear delivering presents. Such a cute stamp set and I love what you did with it! Love your colors :) Happy hopping! Really cute card. Such perfect matching paper. Love the Polar bear and the button. Totally love the bear & your papers! I like your subtle coloring. It's a beautiful card. 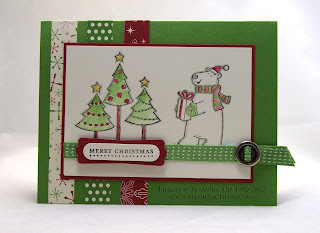 Pat K.
Cute card - love that bear and the different patterned paper strips. I've done all 3: liked your Facebook page, signed up for your newsletter, and now I have left a comment. The card you made for the hop is adorable. I love the stamp(s) you've used. What a cute card! Love the ribbon! I want that polar bear. He's just so darn cute. Cute stamp from SU. The 3 stripes of ribbon are really pretty. I just love the polar bear stamp...he's adorable. Thanks for joining the hop today and offering up your goodies. I love your card for this sketch! So cheerful! Love the polar bear! Thanks for blogging with OWH. Pretty card love the ribbon the colors you used and that stamp is adorable ! I joined your newsletter and liked your facebook ! I like your card and I really like the image and all the ribbons!! I entered all 3 ways; thanks!! What a fun card!! That polar bear set is adorable!! Very cute card. Love the color choice and the ribbon! Thanks for sharing and supporting OWH! Fun card! Love it all but the ribbon placement and accent really rock! tfs!!! So cute! I love that bear! Looks like a great stamp set! Such a fun card--I like the patterns and colors on paper. That polar bear is cute! I like the watercolor look that the trees have. Liked you on FB & signed up for your newsletter. Impressive job coloring and shadowing your images! What a cute card, Sharon! Wow, we are practically neighbors, too. I live in Fort Worth!